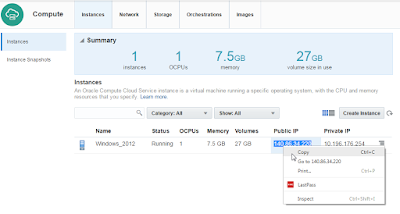 In this post we will see how we can create Windows Instances on Oracle IaaS (Infrastructure as a Service) with desired Image (Windows Version) , Compute , Memory , Disk as well as enabling Remote Desktop service. At last we will enable RDP Connections to the instance and will try to connect. 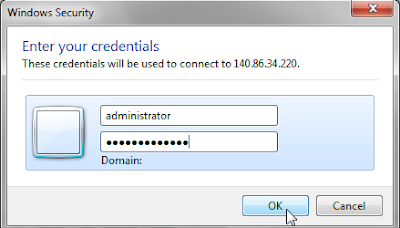 Login to the cloud portal using Identity domain, Username & Password Information. Go to Compute service console. 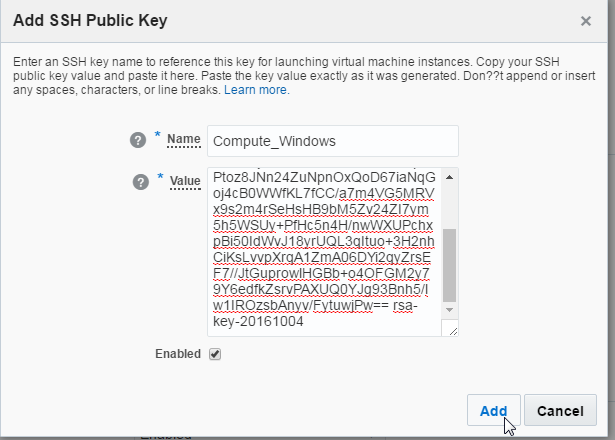 Click Instances and click create instance. Click on MarketPlace to search for Windows Image. 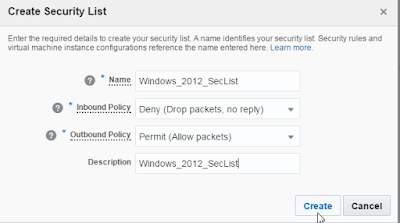 Select windows 2012 Image from the List. Upon Selection, enter a password. Select the Windows Image and then click Next. Next screen we need to select shapes. Shapes are combination of OCPU & RAM. For this example we will use 1OCPU and 7.5GB of RAM. In the Next Screen we need to provide details for the Instance. Enter the Name, Label and Description for the instance. 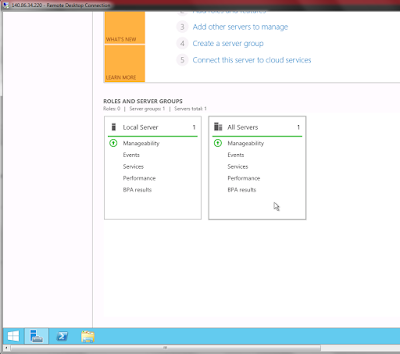 By Default the instances created gets a Public IP address thorugh which it can be accessed through internet. But this IP is not fixed. This means that if the instance is restarted, this IP may change. In order to have fixed IP, We need to do IP Reservation. So Click on Create IP Reservation and Give a name(key) for this IP. We have used. Windows_2012_IP in this case. Select the same name from the drop down. Every Instance should be associated to at least one Security List. 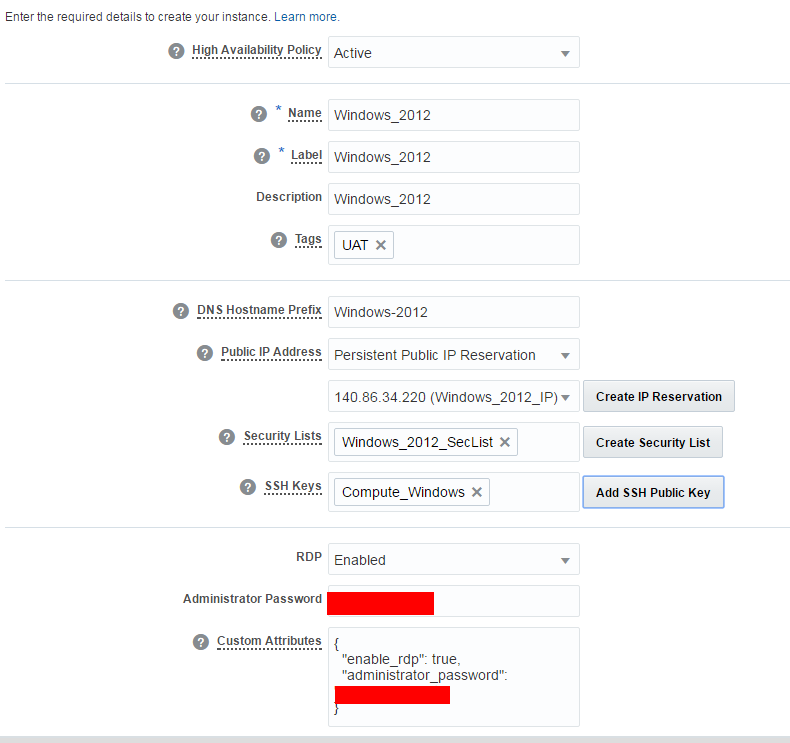 Security List defines how and what connections can be initiated by the instance to outside and from outside to this instance. This basically works as firewall. We will see this in action later. 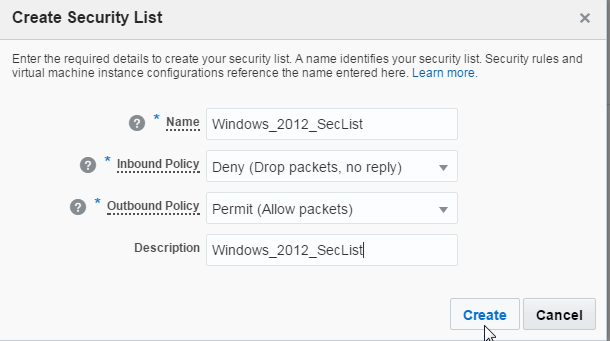 For now just create a new Security list as stated in below steps. As we know for every instance there needs to be a combination of public & private key. So create one like below and select the same. 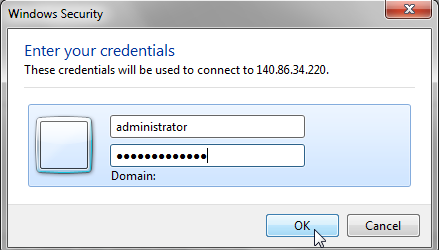 Provide the Password for the Administrator user. 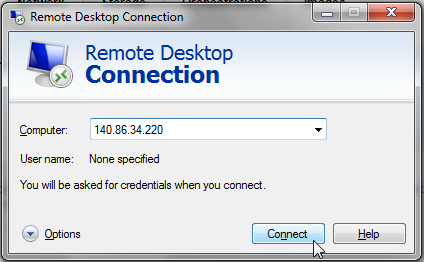 Select RDP Enabled. Next section is storage which lets u add disks to your instances. For this example we will use the default boot drive. Review the summary of the instance which is going to be created. Click Create and there will be a message that Starting Orchestration. Go on Orchestration tab and we will see that there are three orchestrations created and are in starting status. So for every instance that is created, three orchestrations are created. 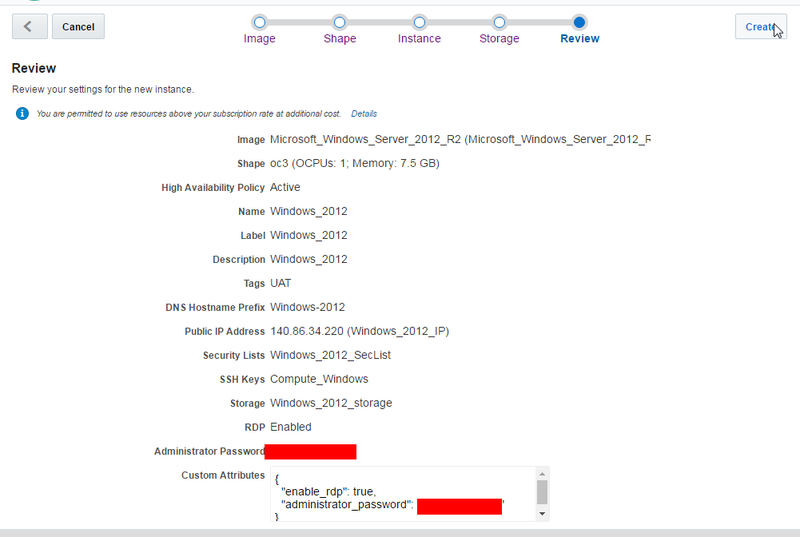 Storage for storage specific configurations, Instance - For instance details and shapes and Last Master which refers to both orchestrations. Orchestrations are JSON files which are data in key value pair about the instances. Once the Orchestrations are ready, go to instances tab, the instance will have status Running with associated Fixed/Permanent IP. 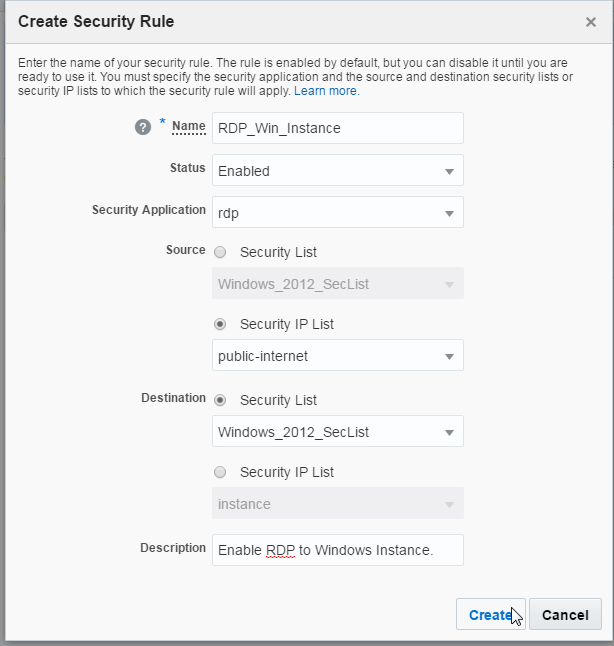 Now in order to make RDP working or in other word for us to do successful RDP connection to this instance , we need to open RDP port on this instance. This is where Security List & Security Rule comes into the picture. 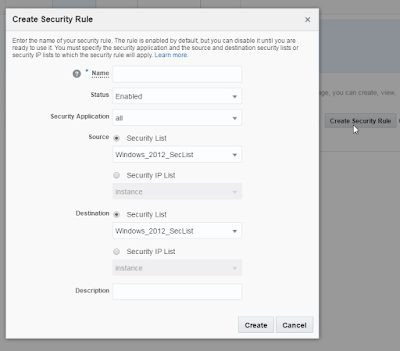 Go to Networks tab and select Security Rule from the left options. Click Create Security Rule. Give it a name, select status enabled, select rdp for security application. 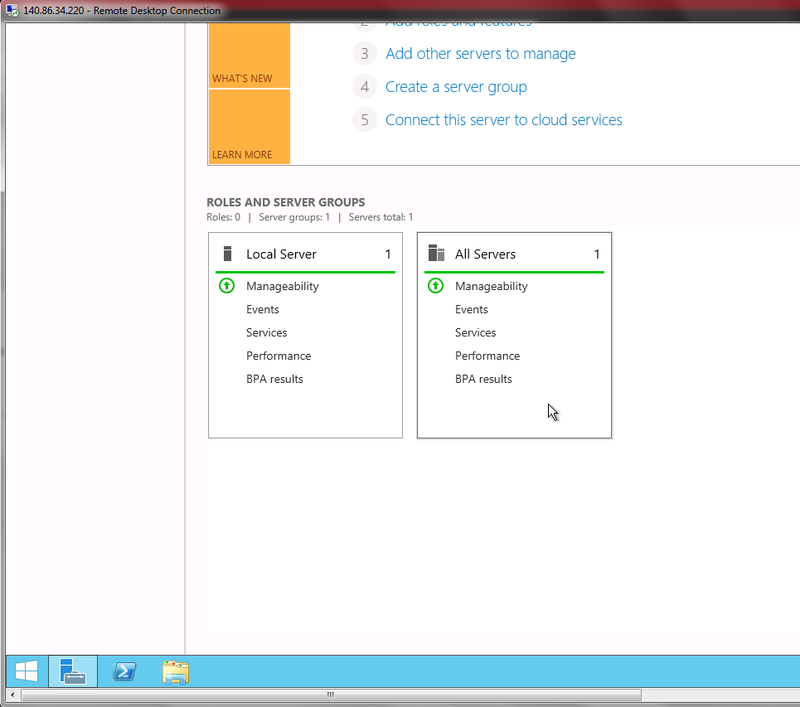 Select Public internet for source and Security List which we created Windows_2012_SecList as destination. This basically says connection can be initiated by anyone from public internet to the instances associated with Windows_2012_SecList. 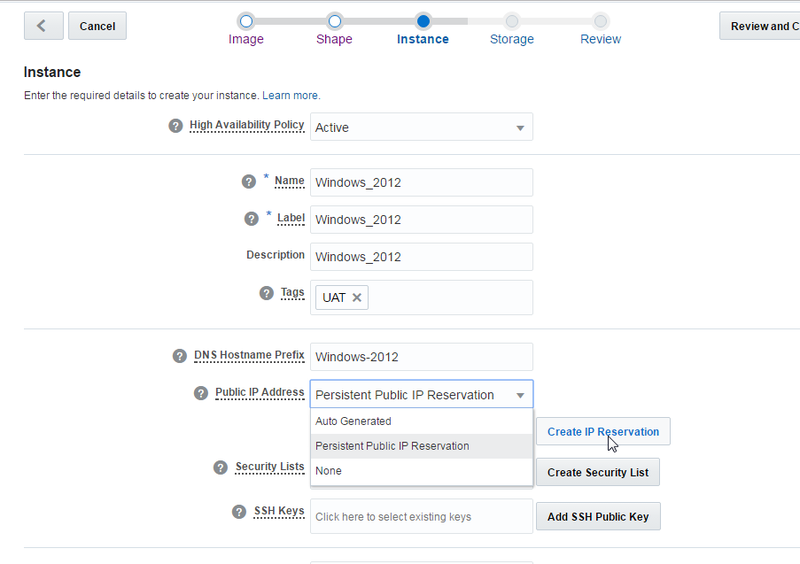 In real environments we will give source as another specific security list with instances from where we need to initiate the connection. The security rule is created. 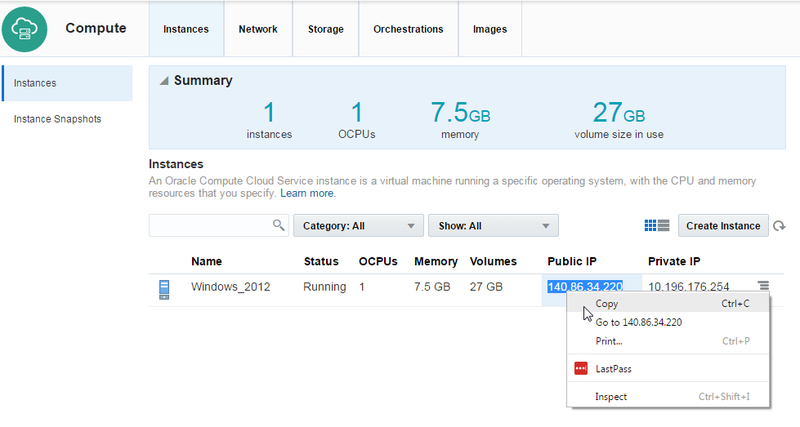 Copy the Public IP of the Instance. Initiate the Remote Desktop Connection from your machine. 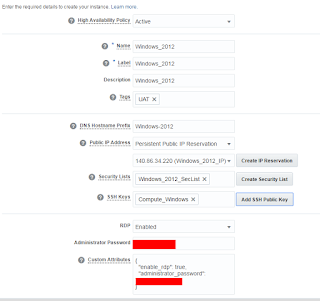 Provide username : administrator and password which we selected while creating the instance. RD Connection is successful ! Nice wording and easy to remember, the format looks more interesting to perform. "Thanking you for given this information.I very much enjoyed this article.php jobs in hyderabad. Your good knowledge and kindness in playing with all the pieces were very useful. I don’t know what I would have done if I had not encountered such a step like this. Thank you for posting this. SEO Training in Janakpuri, SEO is that the method of moving the visibility of the website during a search engine's natural or un-paid or organic search results. SEO is required for your web site to rank well within the computer program result pages.